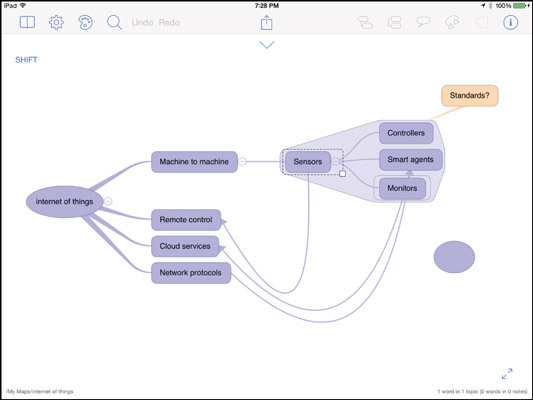 You can use your iPad for mind-mapping. Nonlinear connections are quite useful in the business world, especially when you’re trying to understand a complex notion through the relationships of its many components. That relationship-diagram approach is called mind–mapping, and the $9.99 iThoughts HD is a great tool to use for brainstorming in this manner. iThoughts HD has a version available for the iPhone called just iThoughts; it’s a free download if you buy the iPad version. There’s also a version of iThoughts for the Mac (but not Windows): the $47.99 iThoughtsX. You can share files among all three. The process of mind-mapping is simple operationally — you draw shapes (called nodes) that contain words and then connect them to figure out how they relate. But it is mentally challenging because those relationships require thought, and as you map out more relationships, you may rethink ones you made previously. If you were using paper, you’d use a pencil and do a lot of erasing as you draw and redraw those relationships. But on an iPad, you can do that tinkering without worrying about the remnants of erased lines remaining on your page. Because mind-mapping is primarily a visual endeavor, the user interface of iThoughts HD may seem a little odd at first. For example, you start with a blank canvas, not a folder hierarchy. Tap the Maps button and then tap the Add button (the + icon) in the lower right of the pop-over that opens. Choose Map or Folder in the menu that appears. The Maps pop-over is where you navigate to all iThoughts mind maps stored on your iPad. The three buttons at the bottom of the pop-over control how the mind maps are displayed: Favorites, Most Recent, and Folders (the default view). Tap and hold a mind map in the Maps pop-over and then choose Add to Favorites to mark it as a favorite. You also see the Duplicate menu option, which lets you copy an existing mind map. When you create a mind map, you get an almost-blank canvas that has a central node in the center. This is your “root” node. A root node is one that everything else relates to, so everything ultimately leads back to it. You don’t have to have just a single root node in your mind map, but you do need to start somewhere, so iThoughts HD creates the first node for you. Child (the icon shows one relationship indented below the other): Adds a node that is subordinate to the selected one, meaning that it’s a child to the current node (its parent). In other words, it is a subordinate thought or a component of that other thought. Sibling (the icon shows two unindented relationships): Adds a node that is equal to the selected one, meaning that it’s a sibling to the current node. In other words, it’s an independent thought at the same level as the selected thought. This button is active only after the root node has at least one child. Comment (the icon of a speech bubble): Adds a comment to the selected thought. Related topic (the icon of two connected objects): Lets you connect the selected node to another node that you then tap. These relationships are freeform, meaning whatever they mean to you. Group (the icon of a dotted-line shape): Lets you group items together inside a shape so that you know they have a special relationship. When you tap Group, the selected node and its children are grouped via a shaded outline. As you add nodes, enter the text for them. Double-tap a node to add or edit text if the node isn’t already ready for text input. From these building blocks, you can create very complex webs of relationships for whatever you are exploring. If your map gets overly complex, you can hide child nodes temporarily quite easily. Notice that minus sign (–) icon in a circle to the right of a node that has child nodes? Tap it to hide those child nodes. It becomes a plus sign (+) icon; tap it to unhide those nodes. Here’s how you add new nodes not connected to existing nodes: Tap and hold for a second or two on the screen where you want to add that new node. And there it is! iThoughts calls these floating nodes. Tap any node or object in your mind map. You see a square appear in the node’s lower-right corner. Tap that square and then tap Doodle in the menu that appears. Select the line thickness, line type, and color from the options at the top of the screen. Use your finger to draw whatever you want. Repeat Steps 3 and 4 for additional components of this doodle. The doodle appears near the object you had initially selected, but you can drag it elsewhere if desired. Keep in mind that the mind map is a canvas, and you can scroll and zoom on it using the standard iOS gestures to drill down into your mind map, move among its sections, and zoom out to see the whole thing.